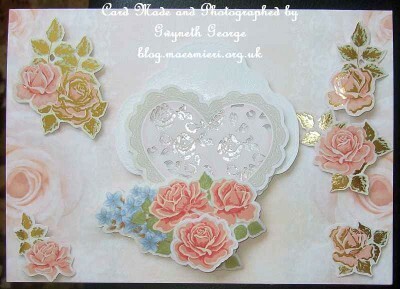 Today’s creations are two cards made mostly using elements from a kit, and some part made textiles projects. I have done some colouring in of digi-stamps but haven’t made them up into cards yet (and a couple of them are for a design team project in any case, so it will be a while before I can show you them in any case). I’ve had a couple of days with a bit of a nagging headache and am a bit exhausted because I’ve had a couple of nights when I’ve not slept comfortably because of aches and pains, so I’ve been trying to have a bit of a snooze during the day and have been doing less crafting. Hopefully I’ll bet back to playing a bit more with my crafting stash before my next blog post. 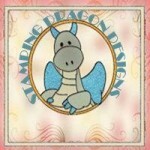 If you want a chance to win a £5 voucher to spend at the Stamping Dragon Designs store then there are two up for grabs. 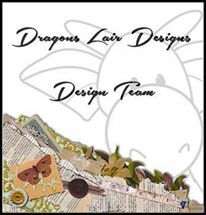 All you need to do is go to the Stamping Dragon Designs page on Facebook, scroll down a bit and look out for the image you see a thumbnail of on the right and just follow the instructions. 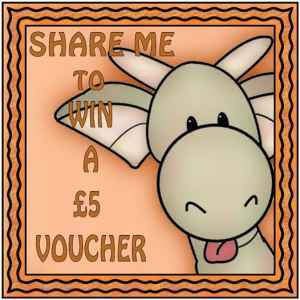 It just involves shareing and commenting on the image on the page so nothing very complicated. Once there have been 100 shares then two winners will be chosen. How good is that? So – what are you waiting for?! These two cards were made from the same “Create & Craft Inspired by …” kit. The first has a bit of additions, but the second only required glue gel in addition to the kit content. Getting the balance of lighting to get a reasonable picture of each was a problem because of the amount of foiling on the elements and added glitter on the first as this was causing “white outs” of glare on most of my photos. 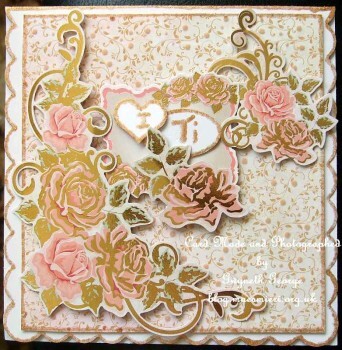 For this card I took a 6″ square card with a scalloped edge from my crafting stash. I also took a Gold glitter Graph’it Shake pen. 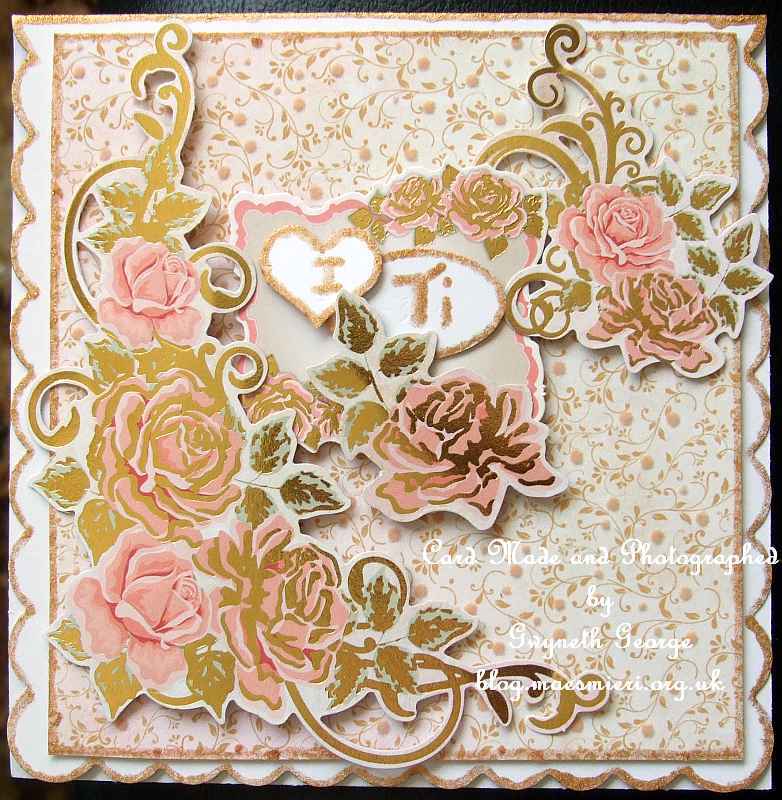 I wanted the card to say “I Ti” – which is Welsh for “For You”, so I took two small greetings panel from the kit and flipped them over. 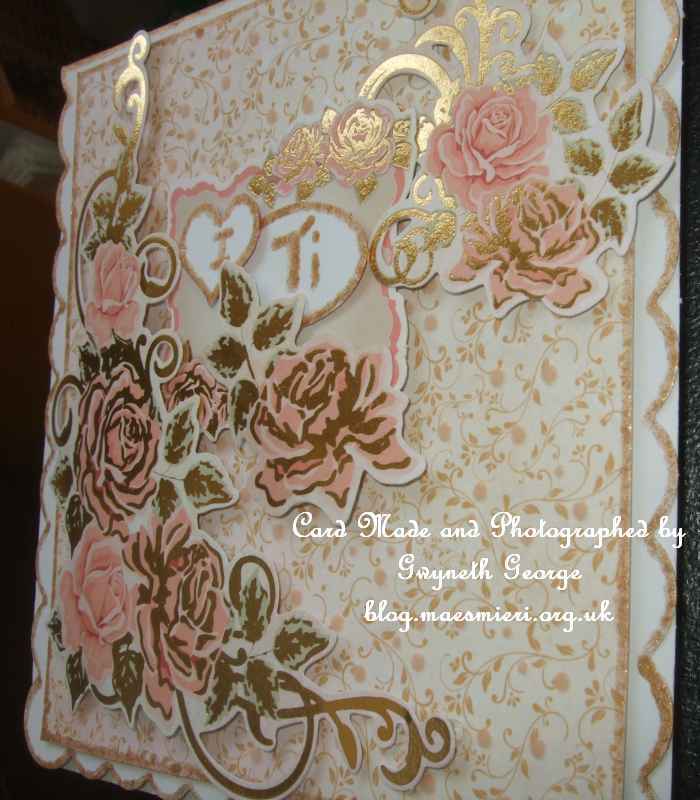 I cut a panel from one of the background cards from the kit and I wrote on the two small panels and went round the outside edge of these panels, the background panel, and the outside edge of the base card with the glitter pen. I then used finger-lift tape to attach the background to the base card and then glue gel to attach my chosen items from the kit. Angled view of card to try and show dimension. I used my Hougie Board to score one of the backgrounds from the kit and then folded it in half. 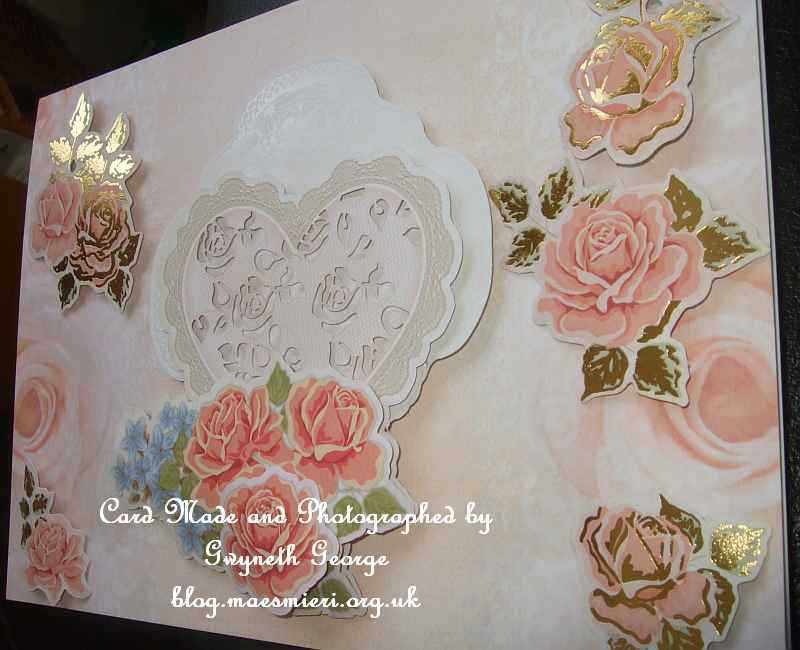 I chose a selection of elements from the kit and gave some of them a little shape before I stuck the lot onto my card front using glue gel. In my web post of the 13th January I showed you a photo of the “Clover Yo-Yo Maker Round – Extra Large” that I’d bought with my Christmas money. I told you I’d show you what I’d be making with it. Well these are the first dozen I’ve made. They’ve not been incorporated into a project yet, but I thought you’d like to see what they look like. 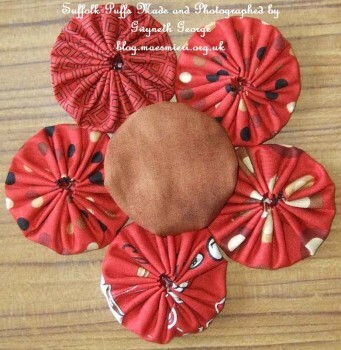 All the material I’ve used so far has come from a single charm pack which is just large enough to clip into the Yo-Yo, or Suffolk Puff, maker. Here you can see the front and back of half a dozen of the Suffolk Puffs that I’ve chosen as I want to use them in the shape of a flower to decorate a patchwork and quilted flat bag I’m making to store my patchwork templates. Once I finish the bag and attach these I’ll take another picture to show you the finished project. These half a dozen I intend to attach together through the middle to make a wiggly snake or catterpillar. 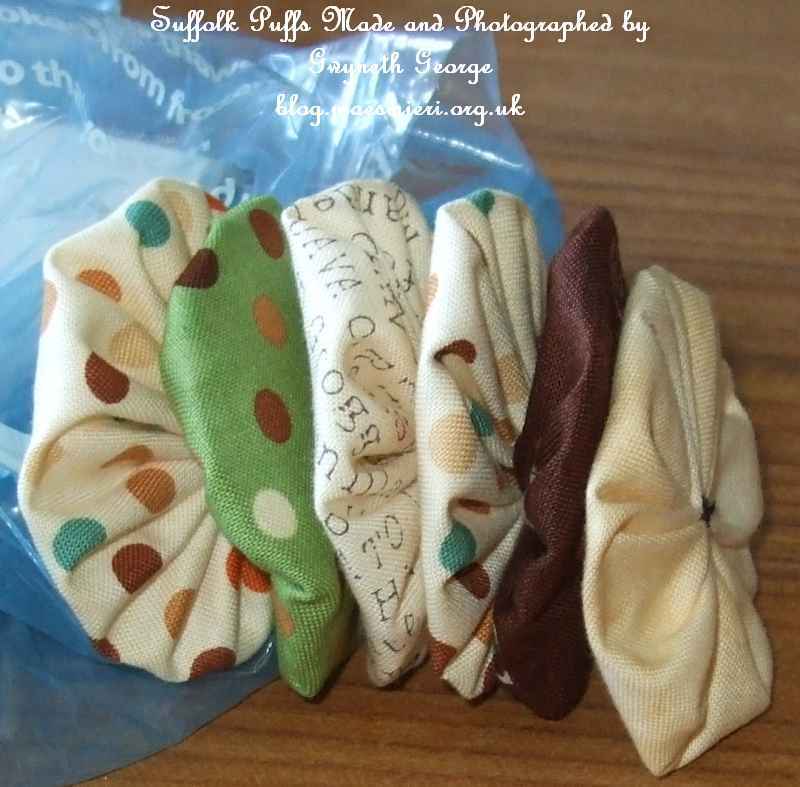 There are a lot of pieces of fabric left in the pack for me to use again, but I can only make these when my hands are working quite well so that I can properly feel and manipulate a needle and thread to make the Suffolk Puffs. Again, once I do finish the project I’ll take a photo to show you, but it could be a few weeks of doing a couple at a time. In my same web post of the 13th January I showed you a Proggy Tool that I’d bought two extra of so that my nephews could work on a rag rug of their own without taking my tool which meaning that I couldn’t work at the same time as them. This is the amount of pieces I’ve pushed through so far. This is again a long term project as I can’t do a lot all in one go, although the piece is resting on my lap when I’m working so I’m not holding the weight of anything more than the little wooden tool. 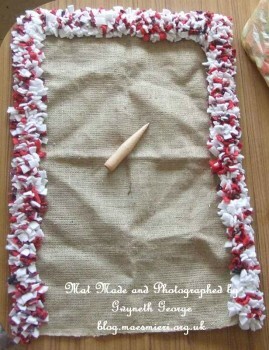 And it’s quite easy to push it through the weave of the hessian backing and push the fabric in through. The material I’m using is fabric fleece which I’ve cut into all the same size pieces using a large craft mat and rottery cutter with the Craft Yourself Silly Strip Cutter and Strip Snip. I bought a large Remnant Pack of Fleece Fabric and I’ve been picking out the white and red tartan coloured bits to make my strips. The nephew who’s already started his is picking out animal print pieces for his project. Corner flipped over so that you can just see the back edge. The side of the hessian backing has been turned over and the pieces of fabric fleece pushed through both layers to give a firm edge that won’t ravel. In my post of the 19th December last year I showed you a ball of mostly untreated wool yarn called “Wash + Filz-it! 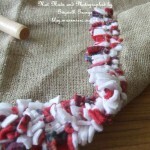 Felting wool”, the yarn ball strap, and a piece of knitting I was knitting from it using a knitting loom . I forgot to take a photo of the first piece before I felted it, but I’ve now finished the second piece and remembered to take a photo this time. This is a finished panel, knitted using 4 balls of the wool mix yarn. I’ve left the knitting board by its side so that you have an idea of the size of it now, before I put it in the washing machine to felt it. I’ll try and remember to photograph it once I’ve felted it in the machine, before I start working with it so remember to pop back for a regular look. 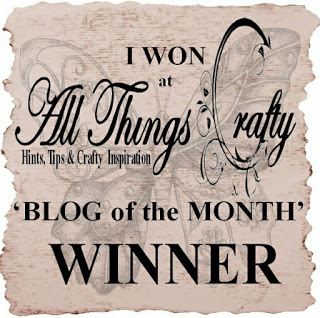 craftsUprint Crafter of the Year 2013 – Voteing is currently underway when CUP designers are “asked to cast 5 votes on who they think are their best crafters” from amongst their customers who upload photos of their completed work to the CUP site. The leaderboard, as it currently stands, has gone live – here. I’m quite surprised to see my name amongst the top 30, but I’m obviously very pleased and grateful. It remains to be seen whether I’ll still be there at the end of voteing of course.